The sum­mit did not change Mus­so­lini’s posi­tion; ins­tead, he in­sisted on waiting for “mathe­ma­tical cer­tainty” before entering the war against the West­ern Allies. Now in April, May, and June 1940, after the Wehr­macht (German armed forces) had made short work of Den­mark, Nor­way, Holland, Bel­gium, and Luxem­bourg, and was now making stunning incur­sions into France, whose govern­ment had fled its capi­tal, the cal­cu­lating Mus­so­lini chafed at the bit to enter a war he believed would be easy and short, and would more­over allow him to add terri­tories bordering the Medi­ter­ra­nean Sea to his own “Fascist Empire”; for example, Egypt where British and Common­wealth forces were out­numbered by Ital­ian forces in the neigh­boring Italian colony of Libya. 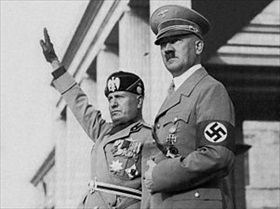 On this date in 1940, Mus­so­lini declared war on France and Britain in the name of Italy, though he had not con­sulted his own govern­ment or the advi­sory Grand Council of Fascism, and the date he had chosen to declare war had been coor­di­nated with Hitler. Respect­ful of diplo­matic nice­ties, the Duce gave his ene­mies six hours prior notice. The following day, on June 11, Mus­so­lini sent the Ital­ian Royal Air Force (Regia Aero­nau­tica) to attack French bases in Tunisia, North Africa, and on the French Medi­ter­ra­nean island of Cor­sica, as well as Brit­ish instal­la­tions on the strate­gically located for­tress is­land of Malta, 55 miles south of Sicily. (The Ital­ian air cam­paign against Malta would last three years and end in failure.) That night the British retali­ated by bombing Turin, a major busi­ness and cul­tural cen­ter in North­ern Italy, and the first Ital­ian city to be hit during World War II. For Italy, the nightmare years were just beginning. Right: British Prime Minister Neville Cham­ber­lain and French Premier Édouard Dala­dier believed appease­ment to be a prac­ti­cal and poli­tically cor­rect way to deter Hitler from further roiling Europe’s poli­ti­cal waters and plunging the con­ti­nent into a second world war. On Septem­ber 29, 1938, in Munich the major Euro­pean heads of state agreed to the in­cor­pora­tion of Ger­man-speaking Czech Sude­ten­land into the Third Reich. 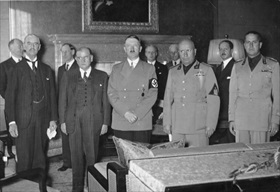 Posing stiffly just prior to signing the in­fa­mous Munich Agree­ment are Cham­ber­lain (left), Dala­dier, Hitler, Mus­so­lini, and Count Galeazzo Ciano, Mussolini’s foreign minister and son-in-law. 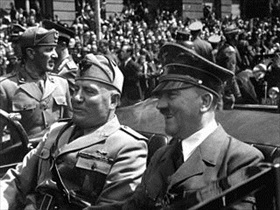 Left: Mussolini visited a clearly triumphant Hitler in Munich onJune 18, 1940, holding dis­cus­sions with his senior Axis part­ner on how to divvy up French spoils. The dis­cus­sions were held in the same room where he, Hitler, Dala­dier, and Cham­ber­lain had divvied up Czecho­slovakia in September 1938. 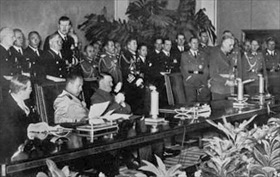 Right: In late September 1940, the Axis Powers grew by one when Japa­nese am­bas­sa­dor Saburō Kurusu (head turned left), Ital­ian foreign minis­ter Ciano, and Ger­man foreign minis­ter Joachim von Rib­ben­trop (standing at podium at right) signed the three-way Tri­par­tite Pact. Hitler (slumping in his chair) wit­nessed the gala pro­ceedings. Within five years all three signa­tory nations would be pul­verized (liter­ally) into sur­ren­der, and all prin­ci­pal figures at the pro­ceedings, excepting Kurusu, dead or soon to be dead.